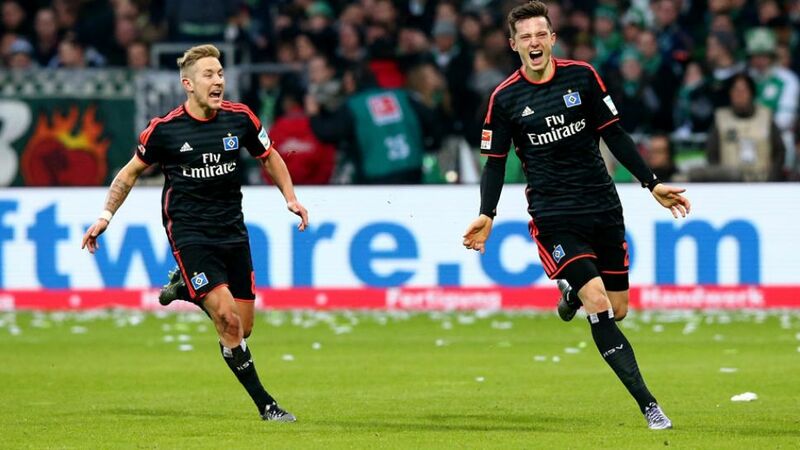 Hamburger SV produced a dominant display at the Weser Stadium to beat SV Werder Bremen 3-1 in the 103rd Nordderby. Looking to build on Matchday 13’s victory over Borussia Dortmund, Hamburg made the perfect start when, after a clinical break, Ivo Ilicevic’s inch-perfect curling shot beat Felix Wiedwald in the Bremen net for HSV’s quickest derby goal in 43 years. It was just the start Bruno Labbadia’s men wanted, as the goal allowed them to pin Werder back and move the ball purposefully. Although Claudio Pizarro’s volley came close for the hosts in response, it was HSV who deservedly scored the next goal when Michael Gregoritsch’s long-range free-kick deflected over a stranded Wiedwald in the 26th minute. Bremen’s response to going further behind was unusually passive. Viktor Skripnik’s side created nothing prior to the interval, and it was the visitors who came closest to another goal, both Lewis Holtby and Gregoritsch threatening. Die Grün-Weißen emerged with renewed vigour after the break, though, Santiago Garcia and Fin Bartels both spurning chances, before Anthony Ujah cut the deficit in the 62nd minute. Hope of a revival was short-lived however. Nicolai Müller restored HSV’s two-goal lead with a brilliant solo effort six minutes later and while Bremen threw everything in the closing stages, the visiting rearguard held them at bay to record a famous victory. Hamburg’s fine first-half performance, which effectively won the game, was inspired by Holtby at the base of midfield. The former FC Schalke 04 star was unflustered in possession, a willing runner on the break and powerful in the tackle. It appears unlikely that Hamburg will repeat their recent dalliances with the drop this campaign. A club reborn under Bruno Labbadia, the Bundesliga Dino are enjoying an excellent season thus far, crowned by this win over their local rivals. Indeed, with home fixtues against FC Augsburg and 1. FSV Mainz 05 to come before the winter break, going into 2016 at the right end of the table is a very real possibility. In the previous eight Nordderby encounters in Bremen, Hamburg failed to score a first-half goal.Gregoritsch’s strike was his second from a direct free-kick this season: more than any other Bundesliga player.Ilicevic’s opener was the fastest goal HSV have scored this season and the fastest Bremen have conceded.